PHOTO BY STEVE WILLIAMS Calvert’s Ashlyn Jones rips a shot past two Ayersville defenders Nov. 1 at Elida in a Division IV regional semifinal match. It’s hard to lose a match when you don’t lose a game. 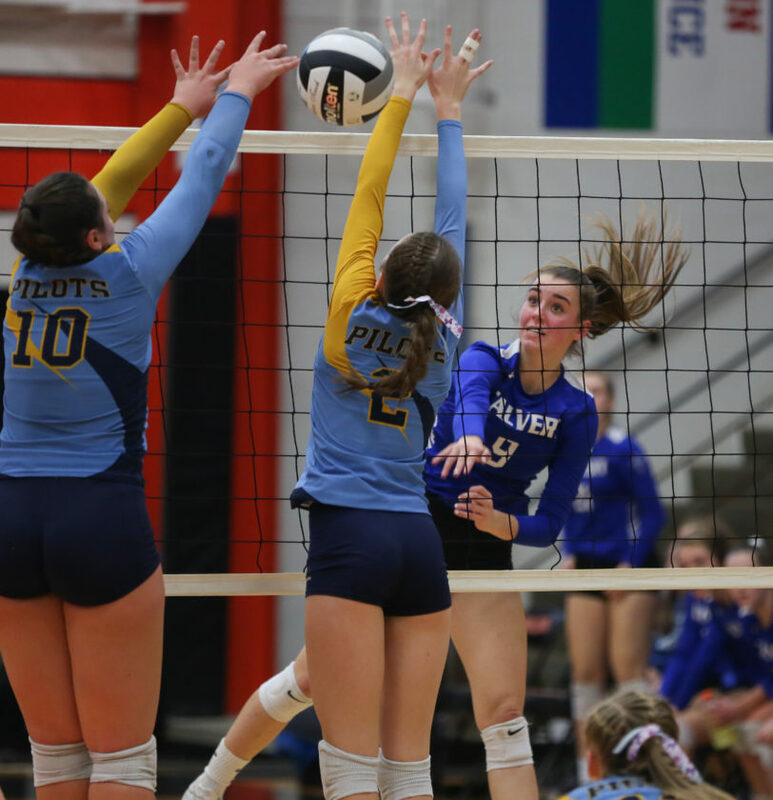 Calvert comes into today’s Division IV state semifinal match with Portsmouth Clay on a roll. The Senecas have won five straight postseason matches to make its first state appearance. Four of those wins were sweeps, including the last three matches. The Senecas enter today’s noon match on a 12-game winning streak. And this is when the matches are supposed to be the toughest. Libero Shelby Hemminger said that the Senecas know the importance of getting off to good starts. But the streak doesn’t mean the team hasn’t faced some adversity along the way. The lone game Calvert lost in the postseason came against Old Fort in the district semifinal in Fostoria. The Stockaders took Game 1, 25-19. That’s what happened against the Stockaders. The Senecas took control and won the next three games, with none of them being especially close. Outside hitter Lexie White said the recent success is due to the team concept. “The 12-set streak I feel like all of us are coming together, grinding out every single practice and playing volleyball,” she said. Coach Lori Rombach said she knows — and the players know — that state will provide some challenges. The key is dealing with the adversity that is bound to occur. “I do feel like we’ve been in control of all the matches of late,” she said. “These girls don’t panic. Some of them like the challenge of trying to dig us out of a hole. White acknowledged there are some nerves about Fairborn. And Meyer said there’s no reason to change the team’s mindset now. And that means plenty of confidence. Assistant Sports Editor Matt Nye contributed to this report.